The WMHPU12 series of Class II medical AC/DC wall mount power supplies provides up to 12 Watts of continuous output power. This series consists of single output models from 5VDC to 27VDC with a 90~264VAC input voltage range. These supplies also have over load and over temperature protection. This series has UL/cUL 60601-1: 2nd Edition (US plug type only) and TUV/T-mark EN60601-1: 2nd Edition (US, UK, and EU types) medical approvals. All supplies are RoHS and Energy Star 2.0, Efficiency Level V compliant. These supplies also meet new CE requirements and are well suited for use in health care applications. 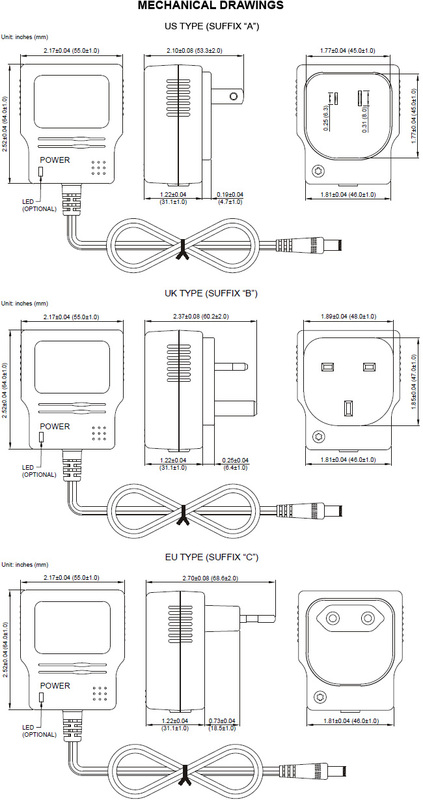 The WMHPU12 series has three types of plugs available: US (A Type), UK (B Type), and EU (C Type). Optional output connectors are also available. Please call factory for ordering details. Notes: 1. Models with a “*” next to the model number are approved by CEC Level V.
2. 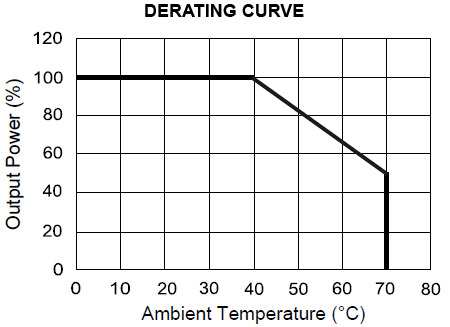 Over Temperature Protection: Thermal shutdown by junction temperature controller; the adapter will automatically recover when the fault condition is removed. 3. Models WMHPU12-102~104 needs to use AWG#18/6FT output cable in order to meet the total regulation specified. Models WMHPU12-105~108 needs to use AWG#20/6FT output cable in order to meet the total regulation specified.